The Bundesliga is back following the international break with a weekend of eye-catching fixtures that make up Matchday 7, starting with a mouth-watering clash between Borussia Dortmund and Hertha Berlin on Friday 14 October at (kick-off 20:30 CEST/18:30GMT). Want to tinker with your Official Fantasy Bundesliga side? You have up until kick-off on Friday to make the most of our offer of unlimited transfers with Fantasy Upgrade! So far this season only leaders FC Bayern München have got the better of Hertha, who will be determined to stay in the upper reaches of the table rather than fade away like they did towards the end of 2015/16. Adding to the excitement will be the sight of two of the joint-top scorers in the Bundesliga so far this term in the shape of Pierre-Emerick Aubameyang and Vedad Ibisevic striving to add to the five goals they have each grabbed. Aubameyang’s place in the footrace for the Torjägerkanone is no surprise given his fine form in the last campaign, but the veteran Ibisevic is riding high after two goals in Hertha's last two outings secured four points from a possible six. Being on home turf will give Thomas Tuchel’s side hope that they can leapfrog their visitors, and close in on Bayern. Head to the Match Centre for more. 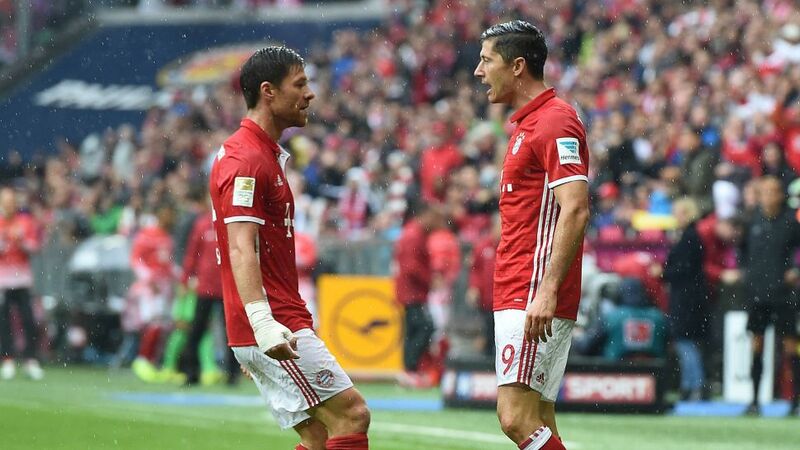 Robert Lewandowski may be another of the strikers with five goals to his name before Matchday 7 – alongside Aubameyang and Ibisevic, Anthony Modeste and Javier ‘Chicharito’ Hernandez are the others - but the Polish hitman will be acutely aware he has not scored for his club in three league outings. However, the gap in domestic fixtures allowed him to take out his frustrations on international opposition, with Denmark on the receiving end of a hat-trick and then Armenia were devastated by a last-minute strike that gave Poland a 2-1 win on Tuesday night. Eintracht Frankfurt beware! It was almost like old times on Matchday 6 for FC Schalke 04 when, with the roof on at a raucous VELTINS Arena, they blew Borussia Mönchengladbach away with a superb second-half display to romp to a 4-0 win. Memories of an awful winless start to the season were quickly banished, and Breel Embolo broke his Bundesliga duck with two welcome goals into the bargain. Royal Blues coach Markus Weinzierl goes back to his former club FC Augsburg with a spring in is step, knowing that Die Függerstädter have a lengthening injury list, with defender Jeffrey Gouweleeuw out for at least a month after suffering a collapsed lung. 1. FSV Mainz 05 face local rivals SV Darmstadt 98 on home soil at the OPEL ARENA having not won on their own patch since May. In their favour is Darmstadt’s poor away form, which stands at three defeats, nine goals conceded and none scored on the road this season. Martin Schmidt’s side ground out a goalless draw at VfL Wolfsburg on Matchday 6, and will be keen to extend their record over their neighbours from last season which saw Mainz claim four points from a possible six against Darmstadt. Unbeaten records to run and run? Having an unbeaten record after six matches is a remarkable feat, and both 1. FC Köln and RB Leipzig will be keen to extend their respective streaks this weekend. Köln’s prolific front-man Modeste will be licking his lips at the thought of going up against FC Ingolstadt 04’s defence, which has leaked 12 goals so far. Leipzig’s superb start to the season is more of a team effort, with Timo Werner their top scorer with three, and they will fancy their chances on Sunday when they bring Matchday 7 to a close at Wolfsburg, who are without a win since Matchday 1. Tune in to five live match commentaries on Bundesliga Audio right here over the weekend!